Local sporting teams are often left behind when it comes to great website design. High prices often make quality custom website design unattainable for teams and committees who largely operate off the funds of player fees and commercial sponsors. 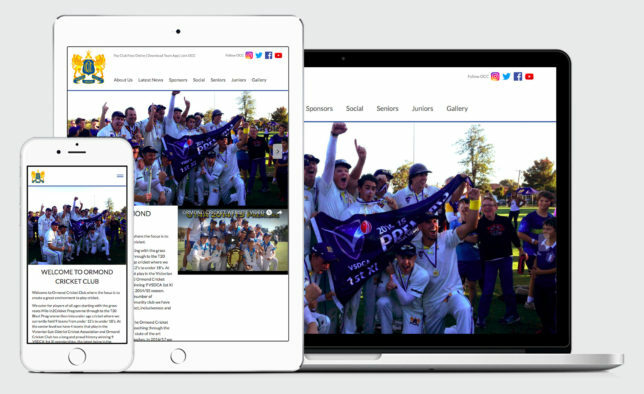 The new Ormond Cricket Club website raises the calibre of sporting team websites to the next level. The updated website has also been optimised for viewing on mobile phones and tablets. This is a massive requirement for sporting teams, given that the majority of the people (teenagers and young adults) accessing their website will do so using a mobile device. Sporting team websites not only keep existing teammates connected, but they can also help attract new members as well. Webtron has a great reputation for building strong, and robust sporting team websites across South East Melbourne. It’s our way of giving back to our local community. Whether your business is large or small, a website should be exciting, informative and visual. And that’s just what we’ve done for the Ormond Cricket Club. In fact, the Ormond Cricket Club’s new website might just be about one of the best local sporting club websites you’ll come across in 2016! Webtron is a proud commercial sponsor for the Ormond Cricket Club for 2016/2017/2018. Check out the Ormond Cricket Club website here!